Today we’ll be building two versions of Reign of Vampirism– one keeping it a two-colour construction, and the other bringing its darker elements to the fore and stripping it down to be mono-Black. 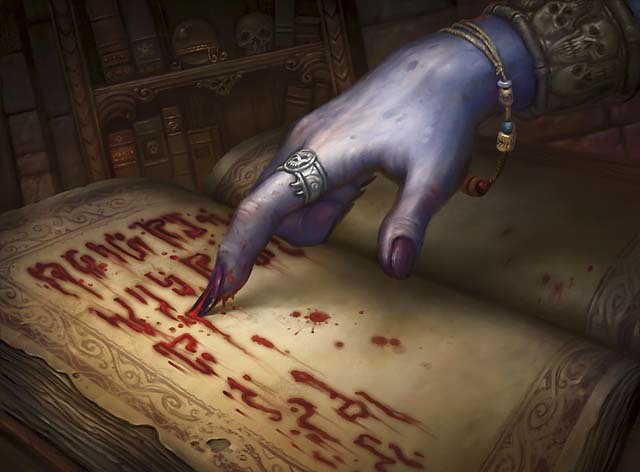 Remember the rules of Ertai’s Meddling: no Rares or Mythics will be added! In addition, we’ll be keeping the core content of the decks intact- we may have some recommendations for cards from other sets, but for the task at hand we’ll only be using M11 cards. We’re going to being with some pretty radical surgery. Perhaps the greatest weakness to Reign out-of-the-box isn’t that it’s two-colour, but rather that that second colour is Green. Not to knock Green at all, but the addition seems to be more in keeping with a colour balance throughout the five Intro Decks rather than due to any innate Golgari synergy in M11. This frees up some room to work with. 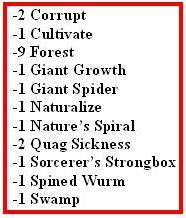 In addition, we’ll be cutting the Black cards that care about the number of Swamps you have in play: Corrupt and Quag Sickness. The former in particular is an excellent card, but for each additional colour in a deck their effectiveness is slashed, so they’re out too. The last- and most pleasurable- cut is the Sorcerer’s Strongbox, a rightfully maligned card. Included for card drawing to get to your setup piece (Captivating Vampire), we’ve got far better options available to us for the mana. As for the creatures, we’ll be dispensing with the services of the Howling Banshees in addition to the Green creatures. The Banshees aren’t bad, but as you’ll see we’ll have even better options in the air once we’re done. Now to determine what we’d like to replace all this with, we need to be confident with what the deck is trying to accomplish. 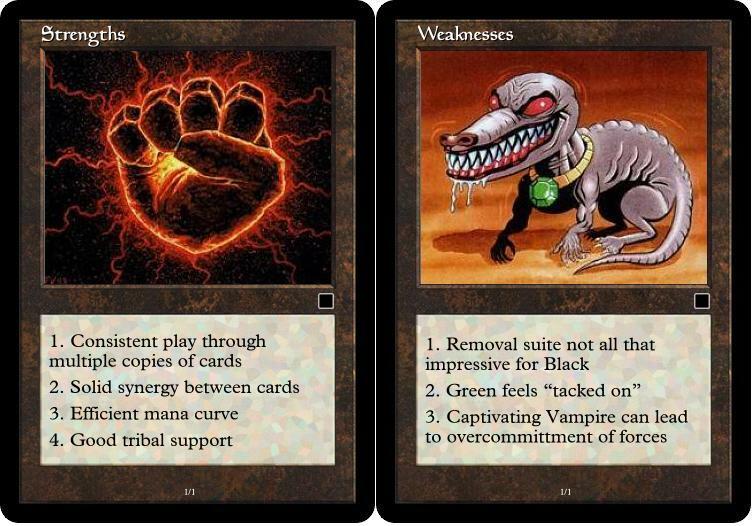 It’s best weapon is the Captivating Vampire’s party trick, which means you’ll need to have lots of Vampires in the deck, ways to get to the Captivating Vampire (since you only have one in the deck), and ways to either protect him or recover him if he dies. Reign already packs a ton of Vamps- no need to add more. But there’s a lot of room for improvement in actually finding him. As designed, the support system for the Captivating Vampire was suboptimal. The two Diabolic Tutors definitely helped, and the card draw from the Sorcerer’s Strongbox was better than nothing (arguably). But since we can’t add more copies of him (he’s a Rare after all), let’s go ahead and increase our ability to find him by bringing in another colour. If there’s a colour that excels at this, it’s certainly Blue, and M11 has some powerful tools on offer to accomplish just that. To start, let’s bring in a pair each of Foresees and Preordains, as Scry will be invaluable here. The Strongbox can go- while rich in flavour it’s simply dreadful otherwise- and we’ll bring in a pair of Crystal Balls. 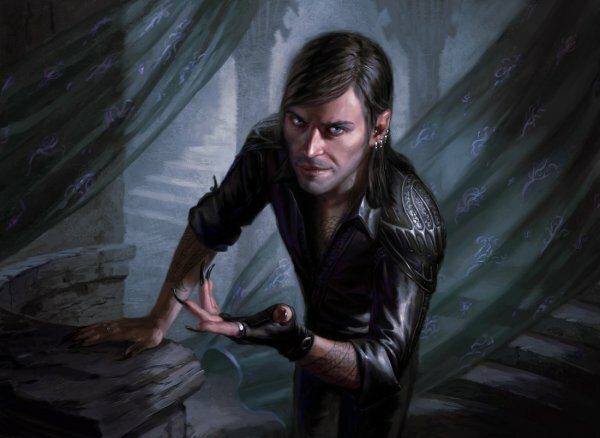 Scry will not only churn us through our deck to get to the Captivating Vampire, but will also let us grab other Vampires to bring his ability on-line if we need it. To beef up our removal, we’re going to need an additional two Doom Blades, bringing the total to four. We’re still two shy of the deck’s original six removers, so let’s tap into the power of Blue and bring in an especially nasty surprise: Mind Control. Sure it’s got a pricetag attached to it at five mana, but it’s hard to beat for swinginess- not only is your opponent losing their best beater, but you’re gaining it. It’s not perfect (it’s especially vulnerable to White and Green, which have common Enchantment removal), but at the right time it can steal you a game. Plus, with two different Sacrifice outlets in the deck (Viscera Seer and Bloodthrone Vampire), you’re protected against Enchantment removal undoing your hard work- just sacrifice the critter instead! Speaking of creatures, we don’t need to make too many changes to Reign’s formula here. 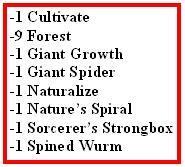 Aside from the Spined Wurm, the creatures we gutted from the original decklist were your air defense: the Howling Banshees and lone Giant Spider. I generally like the Banshees, but their aggressive makeup leaves them somewhat more exposed with a 3 Toughness. Because you might need to buy a little time with some blockers while sifting your deck for an answer, we’ll be slotting in a brace of Azure Drakes. They still give you some punch in the air, but their 4 Toughness can be very useful (avoiding Lightning Bolts, for one). As a last touch, snip out a Swamp and add in ten Islands, just to get a better balance. You’ll be in much better shape to find your Captivating Vampire and begin your control of the board! But what to add? Without Blue to help us get to our Captivating Vampire sooner, we’re still fortunate that Black has a very solid card-drawing option in Sign in Blood, which is a slam-dunk four-of in this build. We’ll also be adding in that pair of Crystal Balls to improve draw quality and find us our answers. We don’t have a lot of changes to make to the Creature list- we only lose two, and this time we’ll be keeping those Howling Banshees for extra aggression. Although they get a bad rap, Wizard devs have said how good they think Rotting Legion is, so let’s go ahead and give them a try, adding two for some back-end punch. Finally for the land, we’ll need 24 Swamps. 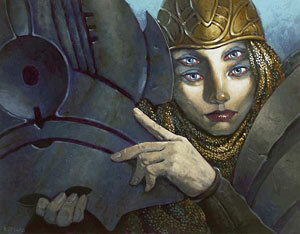 We’re cutting one Land card- as a mono-Coloured deck we can afford to run a little leaner. We hope you’ve enjoyed this installment of Ertai’s Meddling, and hope that you do some meddling of your own! Let us know in the comments how these builds- or any other tinkering you’ve done- has worked out for you with Reign of Vampirism! I played a bunch of rounds with the deck on the MTGO demo mode, and I felt like it was much more of a Reassembling Skeleton deck. If it were me, I’d be maxing out on the skeletons to make use of those sac effects, and consider red as a secondary color for added synergy with Act of Treason effects (plus Emrakul’s Hatcher). Or, in the blue build, Merfolk Looter could be a good source of card advantage that synergizes with Rise from the Grave. I don’t agree with removing Howling Banshee for Rotting Legion. The Banshee is simply a much better card. Anyway, why not swap it for some of the vampires from Zendikar block? It’ll be in-print for the same duration as M11, so they should be just as easy to find. 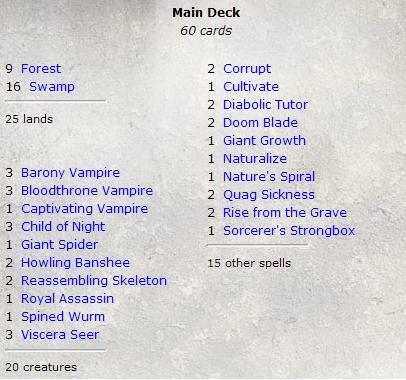 Pawn of Ulamog would go great in this deck, as would Bloodhusk Ritualist, Vampire Nighthawk, or Nirkana Cutthroat. Oh, or Vampire Aristocrat. I like your ideas with Red- having a sacrifice-filled deck with more Skeletons, some Act of Treasons, Flings, and maybe even a Conquering Manticore finisher would be a fun way to position the core of the deck! I’ve actually been tinkering with a “fun constructed” multiplayer deck that works off this, then throws in Jinxed Idol and Bazaar Trader for a little madcap mayhem. Slight misunderstanding on the Legions, and my apologies if it was fuzzy in the post- the Legions come in to replace the Giant Spider and Spined Wurm… in the mono-B variant we’re keeping the Banshees right where they are! I did sub them out of the B/U version, because I felt a 2/4 Blue flyer was stronger in that sort of deck, which trades aggression for time while it assembles its combo. You’re absolutely right about the Zendikar Vamps… the Nighthawk especially is a no-brainer… but part of the Ertai’s Meddling “rules” is to only build from sets that are present in the deck. That means I had to work with M11 exclusively here. The Meddlings will be as much about thought process and card evaluation as end result. That’s one of the things I enjoy about the precons- they can combine the best elements of Constructed *and* Limited! Thanks for the post, some great points and I hope you’ll chime in on the next Meddling! Whoops, I think what I must have meant to point out was that you added 2 legions where you could have added 2 more banshees, right? Or Liliana’s Specter, more copies of the vampires, Juggernaut, Disentomb, Mind Rot, etc. Rotting Legion is a pretty weak creature; it’s a nice card in limited because you can usually draft it very late, but I’m rarely happy to have it in my deck the way I would be with, say, Liliana’s Specter, which is quite good (and good with Disentomb as well if you were to go that route). Good point about the Spectres, I was thinking more defensive-minded and the Legions are a solid body towards that end. Although the Spectres are frail the extra discard may more than make up the difference. I hadn’t thought of that, thanks! Great timing, a friend of mine who plays was skethcing out a deck at work today and thought 4 Mind Controls were a slam-dunk choice, and I had to dissuade him otherwise for precisely that reason- their cost will have them sitting in hand. The customary way to mitigate that is to play less and expect to pick them up along the way when they’ll be more useful, but yeah… not much can be done if you get an early one. Thanks for trying the both of them out on MWS and letting us know! It’s fun to design within the constraints of the Meddling, and great to get some feedback from what we’ve managed to whip up. I was wondering, can you try to playtest some of the meddling decks? It would be quite useful to see how they play out before I get the cards to improve them. Although that’s a bit of a tall order, it’s an understandable one! The Meddling series tends to leverage theorycrafting to streamline the decks (after so many reviews, identifying places for any deck becomes almost instinctive!). We’d like to get such posts up, but right now it’s a factor of time as much as a labour of love! On the upside, we do at least keep the added cards to Common and Uncommon rarities from the same set, so these will often be cards folks have lying about from boosters and such. Also, if you try a different build, we’d love to hear the results! I went ahead and kept Green in the deck. I decided to use Fog for those turns when I want to grab an opponent’s creature with my Captivating Vampire and his posse. A couple of Hunter’s Feast allow me to play a more counter punchy game and some Prized Unicorn allow my vampire horde to run in unopposed. It’s been working quite well. so for deck 1 you say you are cutting the banshees and replacing them with azure drakes but in the cut list the banshees aren’t listed. You cut 21 cards not including the banshees and you replaced 21 cards. Were the banshees meant to be cut or not? If so what would you replace those 2 with since the azure drakes are already in the add list that leaves 2 empty slots.